eG Innovations. Get IT Performance Answers. Engage with the eG Innovations channel for informative and relevant webinars on how applying performance management best-practices in complex, multi-tiered infrastructures can turn IT service delivery into a center for productivity, growth and profit. Along with lots of great Citrix content, eG's senior technology executives, partners and industry leaders discuss current challenges and how to address them through effective performance management in physical, virtual and cloud environments. The modern IT stack has become diverse and distributed, and it’s increasingly challenging to manage heterogeneous platforms and multi-vendor devices. Customers are looking to the cloud and APM to help address these hurdles, as well as accelerate IT transformation. But migrating to the cloud will take time, it won’t make infrastructure ‘just disappear’, and legacy workloads are going to remain part of the enterprise reality for many. In addition, while APM will continue to be increasingly important, all applications are not the same and an application is still not equal to a digital business service. 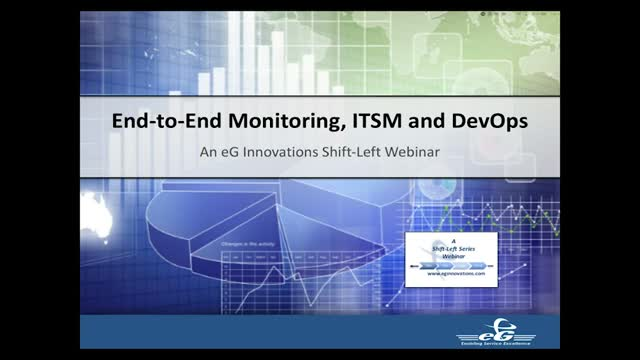 Watch this webinar where John Worthington, a service management expert and Director of Product Marketing for eG Innovations, continues our Shift-Left series. In this session we will discuss why clearly understanding the scope of your digital business services, along with the underpinning ecosystems needed to support them can help accelerate your ITSM and DevOps initiatives. •How end-to-end monitoring with converged application and infrastructure performance can drive ITSM and DevOps integration. In today’s distributed application ecosystems, with various inter-dependencies and dynamic infrastructures, it is extremely challenging to detect and resolve application failures and performance slowdowns. This is especially true in a Microsoft .NET application stack. Developers, IT Operations Staffs and Site Reliability Engineers often get involved in long war room sessions to isolate the root cause of poor customer experience in the digital business service. Join this webinar “How to Ensure High-Performing Microsoft .NET Applications”, by John Worthington, Director of Product Marketing at eG Innovations, as he explores the various problems that could affect .NET application performance and discusses industry best practices for effective performance monitoring. Most APM tools offer user experience monitoring and transaction tracing capabilities, however APM by itself may not enable you to isolate performance issues across an entire digital business service ecosystem. Join us as John Worthington, Director of Product Marketing with eG Innovations, describes how real user monitoring and transaction tracing can be part of a unified monitoring strategy that leverages converged application (APM) and infrastructure (IPM) performance monitoring. Join us for an informative webinar and live demonstration and learn how you can ensure peak performance of your business-critical applications through development, testing, pre-production, and production rollout. With the end of maintenance of Citrix XenApp 6.5 approaching quickly (June 30, 2018), there is increased adoption of Citrix XenApp & XenDesktop 7.x. eG Innovations and DABCC have conducted a joint survey to understand this migration trend, challenges involved, and performance expectations. Get expert feedback and analysis of the migration trends and take away useful tips for successful and seamless upgrade to Citrix XenApp and XenDesktop 7.x! Does Using Citrix Cloud Services Make Performance Monitoring Easier? Organizations now have a variety of cloud-based options for delivering virtualized applications and desktops. Cloud deployments are fast, involve a lower hardware footprint and simplify IT operations. A key question to answer in this context is: Does Citrix Cloud services make performance monitoring easier than it was for on-premise deployments? Watch this webinar by Srinivas Ramanathan, CEO of eG Innovations and increase your knowledge base about monitoring Citrix Cloud services. - What is Citrix Cloud and how does it work? - What are the deployment options available? - What performance challenges will they encounter? - What are the various monitoring tools and options available? Application architectures have become more distributed, heterogeneous, and reliant on supporting infrastructure tiers. The new year will see customers beginning to realize they need to expand their APM monitoring capabilities to provide visibility of these supporting IT infrastructure components. Application managers and IT teams are realizing that they need contextual visibility into how an infrastructure problem affects application performance, and seek APM solutions that can cross-correlate code-level and transaction-level performance with the health of the supporting physical, virtual, container and cloud infrastructures. Join this webinar, as John Worthington, Director Product Marketing at eG innovations, discusses why this cross-correlation is so important and what's required to achieve it. Achieving a single pane of glass for performance management has been an elusive goal, as organizations are faced with an increasingly complex mix of legacy, virtual and cloud technologies, as well as emerging operating models and evolving roles/skillsets. But, monitoring the performance of digital business services demands more than visibility to just the end user experience, applications, or the underlying infrastructure. It requires an ability to automatically anticipate and isolate performance issues across a heterogeneous mix of technologies, devices and suppliers. Digital business services are how end users experience IT, and that is how IT services must be managed. Achieving unified performance management will continue to be elusive until all stakeholders are aligned with this approach. Join this webinar, as John Worthington, Director of Product Marketing at eG innovations, details some best practices for achieving the single pane of glass vision. Attendees will receive the related White Paper, "Best Practices for Achieving Transparency in Digital Business Services Monitoring". Microsoft System Center Operations Manager (SCOM) allows system and application administrators to monitor operations, services, devices and applications within an enterprise through a single console. This single pane of glass can simplify operations, but monitoring the performance of end-to-end digital business services requires more than aggregating measurement data using multiple management packs. From a performance management perspective, unified monitoring is most effective when there’s a single source of actionable truth; it moves us away from diagnosis-related activities and toward collaborating on how to establish self-healing properties when that diagnosis is identified. Not only is this more cost-effective, it’s a more “unifying” activity than troubleshooting. A single pane of glass without an understanding of end-to-end IT service dependencies may just lead to more alert fatigue-- little actionable information due to lack of effective correlation and root cause diagnosis. The results are long problem isolation and diagnosis cycles, resulting in poor user experience and increased IT operation costs. Join us for this webinar as John Worthington, Director of Product Marketing at eG Innovations, demonstrates how you can achieve end-to-end performance monitoring of Microsoft IT services such as SharePoint, Exchange or custom .Net applications--even if those IT services incorporate non-Microsoft components or cloud services—and unify Microsoft SCOM at the same time. In a fast-moving, 24/7 healthcare environment, doctors and nurses cannot afford any impediments to delivering the best possible patient care. To ensure that the hospitals, physicians, nurses and other care providers it serves receive the best client experience possible, Allscripts offers a proactive application monitoring service that checks for potential problems that could slow down or disrupt the use of its mission-critical healthcare IT systems. Initially launched in 2006, the proactive support offering monitors clients’ IT infrastructure and use of Allscripts solutions. Since its introduction, Allscripts has been able to improve client experiences in a way that has had a significant impact on business growth and client retention. A converged APM/IPM solution can facilitate true root-cause analysis from an end-to-end IT service management (ITSM) perspective, inclusive of both supporting and customer-facing IT services, as well as across multiple service lifecycle stages. In addition, by having all service team members share an easy-to-use interface that is tailored to each of their requirements minimizes learning curves, enhances operational efficiency and ensures user satisfaction by providing a production-grade monitor to IT staff that are working in staging environments. Attend this webinar to discover how a converged APM/IPM solution can be leveraged effectively in pre-production to eliminate bottlenecks in testing, delays, re-work or increased deployment risk.